This extended range of EF whiteboards has all the look and quality of standard whiteboards, but is constructed from a large proportion of recycled materials. EF range offers environmentally kind products at an economical price. Contoured frame in a choice of three attractive finishes Light Oak, Aluminium effect, and Blue. 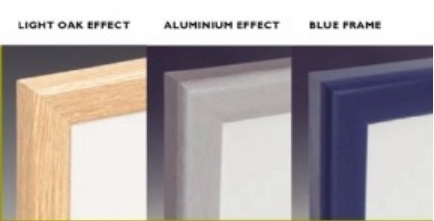 90 x 60cm boards have a 28mm frame, while the 3 larger sizes have a heavy duty 45mm frame. Supplied complete with fixing kit.